Enhancing the features of sophisticated patterns, these rectangular glass beads are the superb synthesis of carving & painting skill. 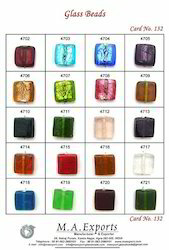 Pressed beads are made when a heated glass rod is pressed into a mold. 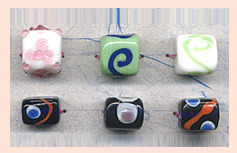 Pressed Beads come in a large variety of shapes, sizes and color. At Art Group we believe that our wide range of Pressed Beads is a great element to stimulate and materialize your creativity. Pressed Beads are sold in a bunch, where one bunch consists of twelve 16 inch strings. We are recognized as one of the prominent fabricators and exporters of a wide array of Press Beads. These are fabricated using best grade of factor inputs, which enhances the durability and beauty of the product in an apt manner. These are appreciated by our clients for their outstanding shine and attractive designs and shapes. We are among the best known companies that specialize in the manufacture, supply, export, wholesale and retail of Pressed Glass Beads. These beads are available in wide ranging shapes and sizes. Pressed beads are made when a heated glass rod is pressed into a mold. Pressed Beads come in a large variety of shapes, sizes and color. At Art Group we believe that our wide range of Pressed Beads is a great element to stimulate and materialize your creativity. Pressed Beads are sold in a bunch, where one bunch consists of twelve 16 inch strings.